I am Belgian, so it pretty much goes without saying that I love my chocolate. Everything you ever heard about Belgian chocolate is probably true: we have the best chocolate in the world, more variations of size, shape and taste than you can imagine and we consider it to be very normal to eat chocolate for breakfast, every day. When my friend Meghan from Playground Parkbench organised this Food from Around the World blog hop, I knew I had to honour the humble and delicious Belgian chocolates. Since I am not a very talented cook (despite the fire alarm regularly cheering me on) I had to fake it till I made it. And so these gorgeous felt chocolates came to be. In fact, they look so great that my toddler managed to get his hands on one and was hiding behind the couch trying to eat it. He truly is his mother’s son! Read on to see how we made our Belgian felt pralines and be sure to grab your free pattern so you can easily start making them at home yourself! 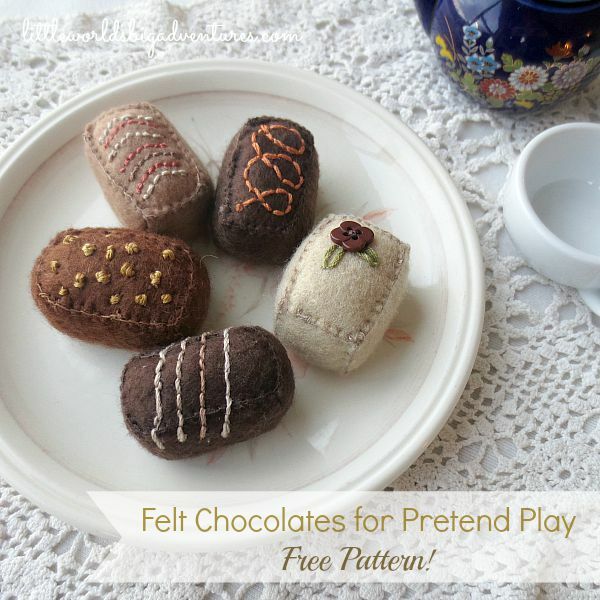 These felt chocolates are very easy to make. I came up with a simple pattern so literally everyone will be able to pull this off. No previous felt toy making experience needed. 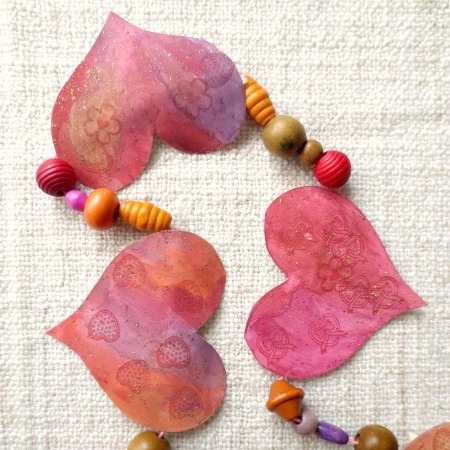 All you need to do is print the pattern, grab your materials, follow the instructions, get creative with your decorations and have fun. 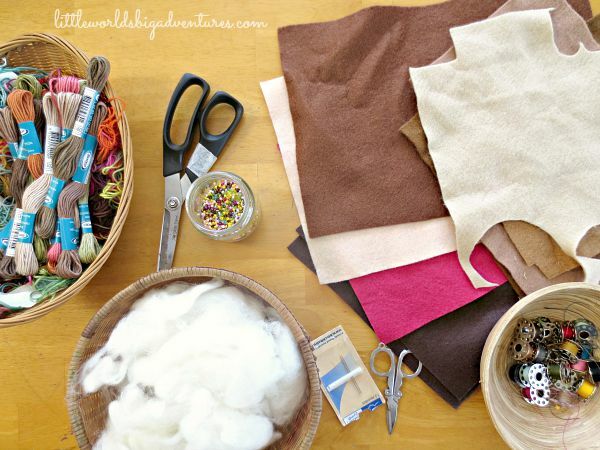 Materials you might need: felt, scissors, needle, thread, embroidery floss, cardboard and wool (or synthetic filling). The first thing you do is cut out your paper pattern. 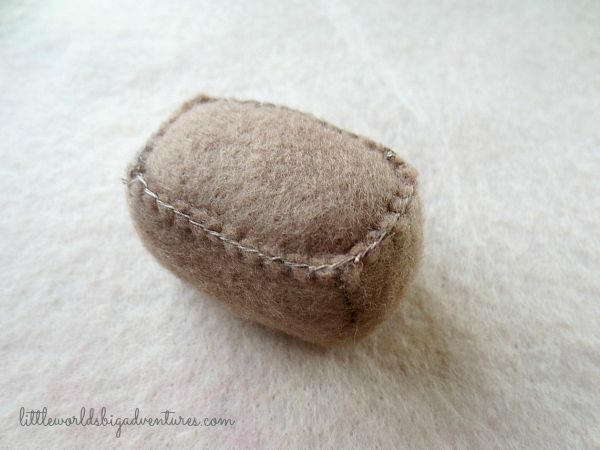 Attach the pattern to the felt with a pin and cut it out. 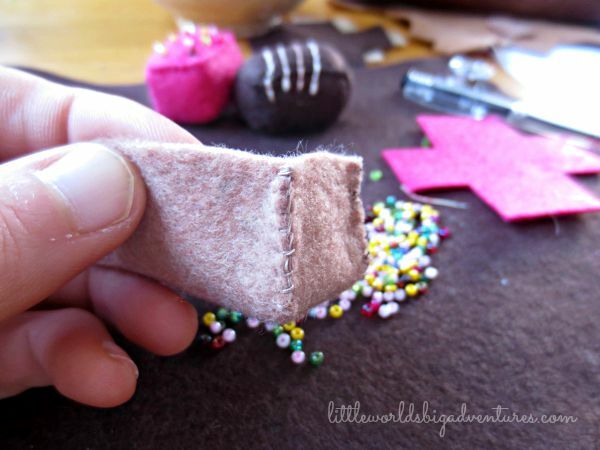 Start sewing the corners together by hand like in the image above, using regular thread. Make sure that these stitches are close to each other and secure. You don’t want them to burst open when we’re stuffing it with wool later on. When you’ve stitched all four corners closed, it should look like a little basket. 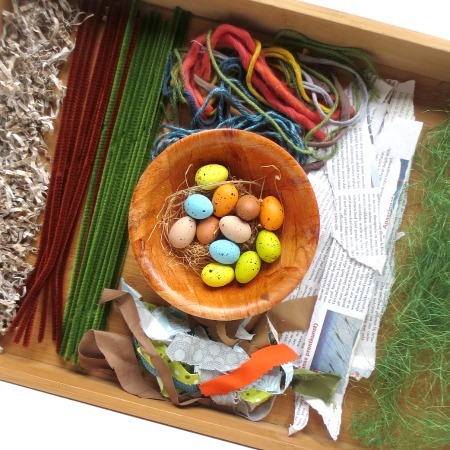 Now turn your basket inside out so the stitching is on the inside. 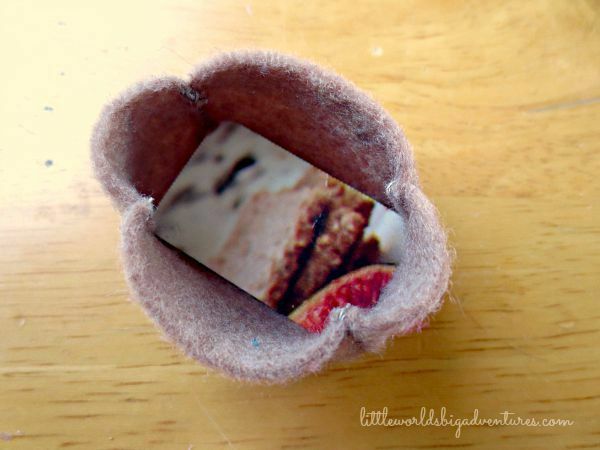 Then cut out the tiny cardboard rectangle and place it on the bottom of your basket. It’s important to put the cardboard in there to create a firm base. 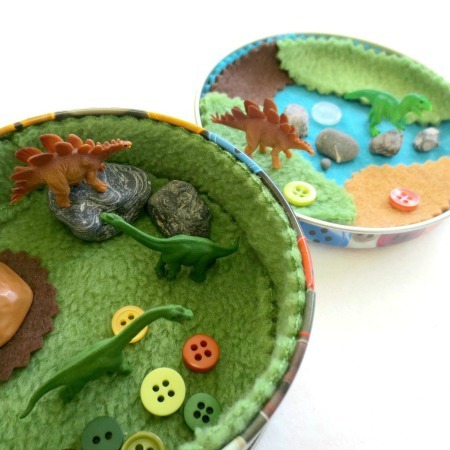 When you fill up a felt creation with wool, it will stretch a bit and the sides will be slightly round. By putting cardboard on the bottom you’re making sure that that side will stay nice and flat. You don’t want your chocolates to start rolling away. 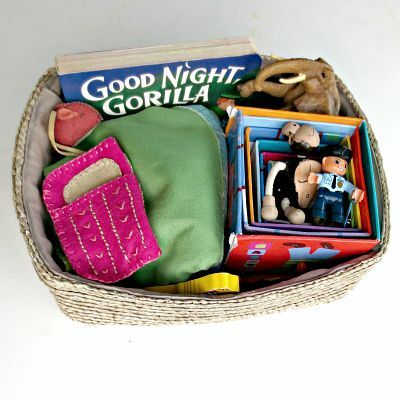 When the cardboard bit is put in place you can start sewing the top rectangle onto your basket. These stitches will stay visible on the outside, which will create some sort of platform for your decorations later on. When you’re stitching, be sure to leave one side open to put the wool through. I like this part. It always amazes me how much wool you need to fill up such a small space! We used about a good handful of wool for one chocolate. 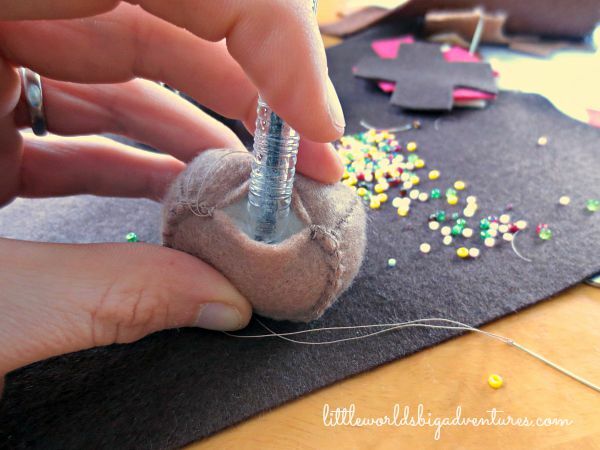 I remember one of my first Steiner handwork groups where a kindergarten teacher was showing me how to stuff my felt chicken. She kept telling me to add more wool and after a while I thought she’d gone mad, I couldn’t possibly fit more wool in there! And yet I added more and more and more and more to the point I thought it was ridiculous. 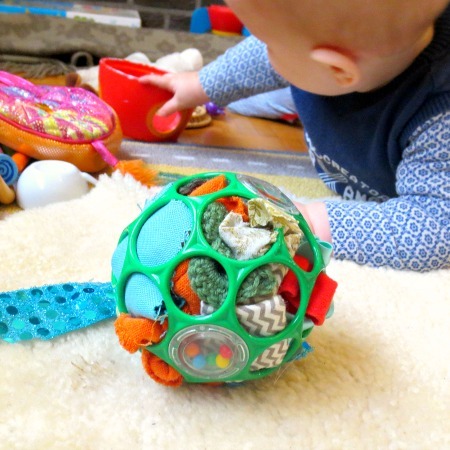 The thing to keep in mind is that when children play with felt toys, it gets manhandled a lot and you don’t want your creations to go all sad and limp after a few weeks of intense play. So when you’re filling them, make them as hard as possible. Another little tip is to loosen up the wool before you stuff it in. That way the wool gets spread more evenly and you avoid creating hard bumps in your felt creations. Use a crochet hook, knitting needle or pencil to push the wool in. Be careful not to push through any stitches or felt though. When finished it should look a bit like this one in the image above. Once you have your ‘basic chocolate’, you can start decorating. Anything goes, have fun. Here’s what we came up with. 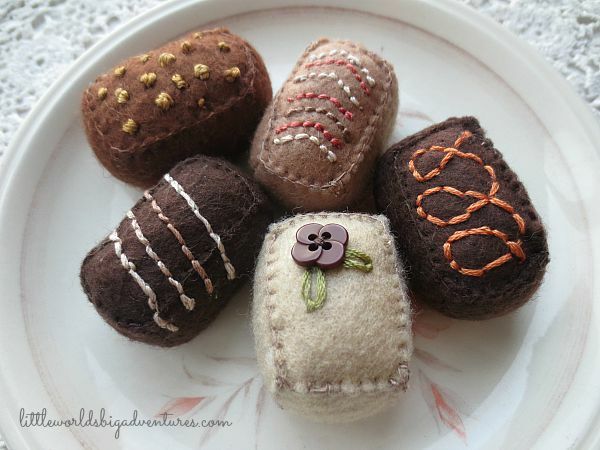 The white chocolate one is my favourite, that button and those hand stitched leaves are too cute! You can imagine the fun we’ve had. 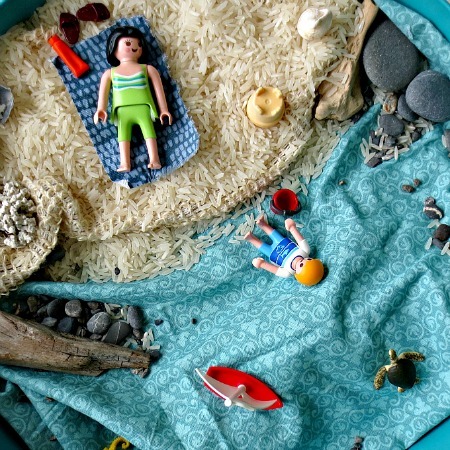 My daughter, who is almost five, gets really into her imaginative play. She has been organizing tea parties all week long. I love how she experimented with table arrangements, clearly understanding that these chocolates were something special, a treat you don’t get every day. We also kept empty chocolate boxes (I happily volunteered to eat some!) so she could sell them or wrap them up as presents. 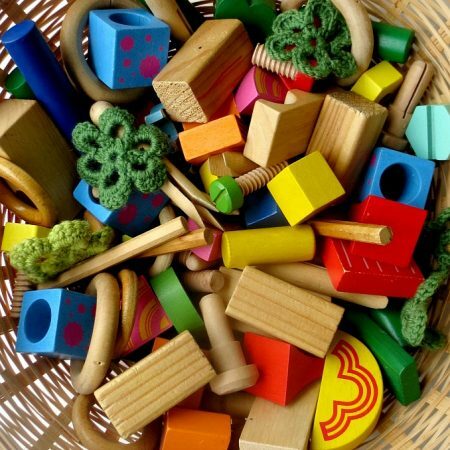 I love making these little handmade play things for my children. They learn a lot from watching me make things and seem to appreciate the time and effort that has gone into them. Especially my daughter will take good care of the things I made for her because she knows I don’t have the time to keep making new ones and that I won’t if they treat their gifts disrespectfully. 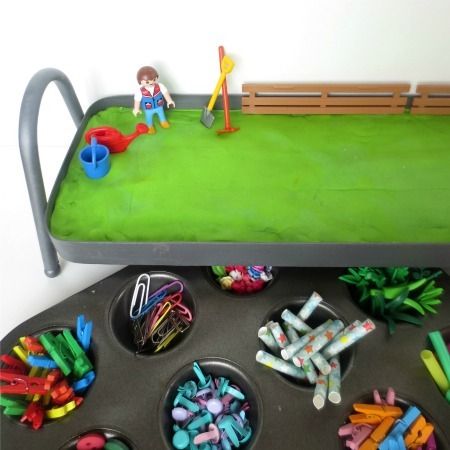 Props like these encourage imaginative play immensely. 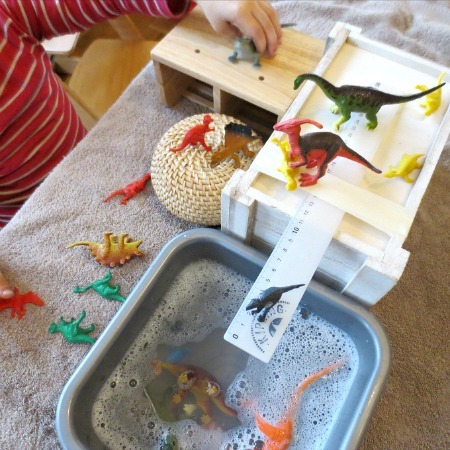 You can introduce them in an invitation to play and then watch the magic unfold. I absolutely adore spying on my children when they are playing out their fantasies! Little sets of chocolates would also make a great gift. It’s pretty expensive to buy quality handmade felt anywhere and not all parents enjoy a good craft session. If anything, I have a few friends who would run the other way. (I’m not naming my sister!) So I know it would be a very special gift to a lot of people. If you do enjoy a good mommy project and loved reading this, you might also like these cute fairy braid hair clips, our adorable (and practical!) 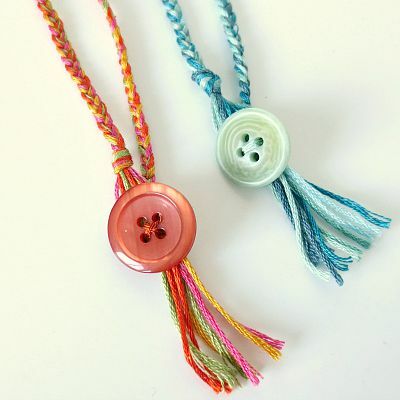 braided bookmarks and if you enjoy a good diy challenge, this one is for you! Loved this post? You can pin it here.